We are thrilled to welcome these men to priesthood in the Society of Jesus. This time is a gift for the Jesuits, for the family and friends of those being ordained and, most of all, for the Catholic Church. The Society of Jesus, the largest order of priests and brothers in the Roman Catholic Church, will ordain 28 Jesuits in Canada and the United States to the priesthood this summer — the largest group of new priests ordained by the Jesuits in more than 15 years. Each of the 28 being ordained has a distinct path to the priesthood. Brent Otto, SJ, 35, from Framingham, Massachusetts, and Erick Berrelleza, SJ, 32, from Los Angeles, were both deeply affected by the attacks against America on 9/11; the tragedy helped inspire them to discern God’s calling, and their commitment to service was a factor in their decision to become Jesuit priests. 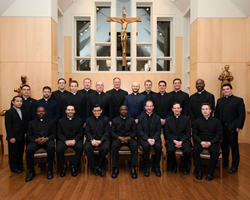 Nineteen of the 28 men being ordained attended a Jesuit high school or university, and some entered the Society even before they graduated from college. Others had careers before discerning their vocation. Gregory Kennedy, SJ, 40, from Ontario was an organic farmer; Jacob Martin, SJ, also 40, was an improv comic in his hometown of Chicago; while Randall Gibbens, SJ, 37, from Metairie, Louisiana, built golf courses before joining the Catholic Worker House in Houston. At upwards of ten years, the Jesuit formation process is rigorous. Each of the men being ordained has earned a graduate degree in theology; they’ve all served at Jesuit high schools and colleges, and many have traveled abroad to work with the poor. They’ve served in local Catholic parishes and homeless shelters and as chaplains in hospitals and prisons, just as St. Ignatius of Loyola, founder of the Jesuits, laid out in his precise guidelines for Jesuit formation. Ordination ceremonies will be held this Saturday at Queen of All Saints Basilica in Chicago; Saint Joseph Church in New Orleans; Blessed Sacrament Parish in Hollywood, California; and Fordham University Church in the Bronx, New York, for the 27 U.S. Jesuits. Fr. Gregory Kennedy was ordained at Our Lady of Lourdes Parish in Toronto on May 23. As they begin their first assignments as Jesuit priests, the newly ordained will embark on a variety of ministries, including working in parishes in Honduras, Puerto Rico and the U.S.; serving at Jesuit high schools and universities; continuing their studies toward advanced degrees; and serving at Jesuit ministries. Dennis M. Baker, SJ, 35, was born and raised in upstate New York. A member of the boards of trustees of Fairfield University in Connecticut and Regis High School in Manhattan, his lifelong love of sports helped inspire his recent report for the Association of Jesuit Colleges and Universities on mission, identity and athletics at Jesuit schools. Erick Berrelleza, SJ, 32, is a native of Los Angeles. At the Boston College School of Theology and Ministry, he earned a Master of Divinity degree while serving as a deacon at St. Mary–St. Catherine of Siena Parish in Charlestown, Massachusetts. He is a member of the board of trustees at Santa Clara University in California and an associate trustee of Boston College. Victor M. Cancino, SJ, 32, grew up in Los Angeles. He taught theology for three years at Verbum Dei High School in Los Angeles while also running the drum line and working with campus ministry. After ordination, he will serve at Dolores Mission Parish in East Los Angeles before studying at the Pontifical Biblical Institute in Rome. Julian A. Climaco, SJ, 40, was born in Cebu, Philippines, and lived there until he was 10, when his family immigrated to Los Angeles. He earned a Master of Divinity degree from the Jesuit School of Theology of Santa Clara University in Berkeley, California, while using his nursing skills to help at a free medical clinic for immigrants and the poor in Oakland. Loren Adam DeLeon, SJ, 33, grew up in Cleveland. He earned a master’s degree in social philosophy at Loyola University Chicago and then taught for three years at Christ the King Jesuit College Preparatory School on Chicago’s west side. After ordination, he will serve at St. Columbanus Catholic Church on Chicago’s south side. Ryan G. Duns, SJ, 35, hails from Cleveland. He earned a master’s degree in philosophy in 2009 from Fordham University in the Bronx, New York, and ran student programming for the Curran Center for American Catholic Studies. He also taught theology and Latin and ran the Student Senate for three years at the University of Detroit Jesuit High School and Academy. Aaron K. Engebretson, SJ, 35, grew up in Kalispell, Montana. During his sophomore year of college, he began the process of converting to Catholicism and discerning a vocation to the priesthood. He taught history for three years at Bellarmine Preparatory School in Tacoma, Washington, while also coaching the golf team and serving on the school’s board of directors. Carlos D. Esparza, SJ, 35, is from the Dallas suburb of Richardson, Texas. He taught math for three years at Strake Jesuit College Preparatory in Houston while serving as a chaplain for the sports teams and moderating the Hispanic Student Union. He serves on the board of Jesuit College Preparatory School of Dallas, where he attended high school. Vincent A. Giacabazi, SJ, 33, grew up just outside Peoria, Illinois. After earning a degree in political science from Saint Louis University, he joined the Jesuits’ Alum Service Corps for a volunteer teaching assignment at Rockhurst High School in Kansas City, Missouri. Following ordination, he will serve in Belize for the summer and at Rockhurst High in the fall. Randall S. Gibbens, SJ, 37, grew up in Metairie, Louisiana, and attended Jesuit High School of New Orleans. He received a bachelor’s degree in agronomy from Texas A&M University in College Station, Texas, and worked at Casa Juan Diego, the Catholic Worker House in Houston, before entering the Jesuits in 2004. After ordination, he will work in parish ministry in Honduras. Joseph M. Hill, SJ, 33, grew up in Phoenix until the age of 9 when his family moved to England, where he attended a Jesuit boarding school. He has lived in the Bronx, New York; Boston; New Orleans; the United Kingdom; Mexico; and Brazil, and after ordination will serve as associate pastor of San Ignacio de Loyola Church in San Juan, Puerto Rico. Gregory M. Kennedy, SJ, 40, was born and raised in Hamilton, Ontario, and has a doctorate in philosophy from the University of Ottawa. During summer breaks, he traveled through Europe and Canada “wwoofing,” volunteering on organic farms in exchange for room and board. After ordination, he will work toward a Licentiate in Sacred Theology at the Pontifical Xavierian University in Bogotá, Colombia. Joseph A. Koczera, SJ, 35, is from Rochester, Massachusetts. Since 2012, he has studied at Regis College in Toronto, where he received a Master of Divinity degree and will continue working toward a Licentiate in Sacred Theology after ordination. He appreciates the international dimension of his Jesuit formation, which has included studying German in Austria and Spanish in Peru and Chile. Christopher J. Krall, SJ, 32, grew up in Marshfield, Wisconsin. At Marquette University High School in Milwaukee, he taught physics and religion while coaching the cross country, tennis and ski teams. Following ordination, he is missioned to the Church of the Gesu in Milwaukee and also expects to pursue his interest in military chaplaincy programs and a doctorate in philosophy and science. Lukas M. Laniauskas, SJ, 31, grew up in Cleveland. In 2012, he began studies at the Jesuit School of Theology of Santa Clara University in Berkeley, California, toward a Master of Divinity degree. He served as chaplain of the Berkeley Fire Department, responding to emergencies as well as attending to the spiritual needs of the firefighters at the city’s seven stations. Juan Pablo Marrufo del Toro, SJ, 36, was born in Guadalajara, Mexico. He earned a master’s degree in philosophy at Loyola University Chicago in 2009 and taught math and religion at Seattle Preparatory School. He has worked at the Vatican Observatory in Rome. Jacob D. Martin, SJ, 40, was born in Chicago. He spent five years doing improv and sketch comedy in Chicago after college. During his Jesuit formation, he authored a memoir, “What’s So Funny about Faith,” and taught theology and theater at Loyola Academy in Wilmette, Illinois. Timothy M. McCabe, SJ, 52, is from the Detroit suburb of Ferndale, Michigan. Always drawn to the poor and marginalized, he became involved with the Detroit peace community and the Catholic Worker Movement as a young man. After ordination, he will serve as associate pastor and director of the Warming Center at Saints Peter and Paul Jesuit Church in Detroit. John R. Nugent, SJ, 33, is a native of Houston. He attended Texas A&M University in College Station, Texas, earning a bachelor’s degree in biology. Most recently, he earned a Master of Divinity and a master’s in theology at the Boston College School of Theology and Ministry. After ordination, he will return to Boston College to pursue a master’s in education. Ronald R. O’Dwyer, SJ, 32, was born in New Orleans. As a Jesuit novice, he taught religion at Loyola Academy in St. Louis. Next he studied at Saint Louis University and earned master’s degrees in philosophy and education and then taught religion at De Smet Jesuit High School in St. Louis. Brent H. Otto, SJ, 35, grew up in Framingham, Massachusetts. In 2006, he was sent to Fordham University in the Bronx, New York, where he earned a master’s degree in philosophy and completed a joint master’s program in International and Global History from Columbia University in New York and the London School of Economics. He is a board member of the Ignatian Solidarity Network. John W. Peck, SJ, 34, grew up in New Kensington, Pennsylvania. He taught philosophy at Loyola University Maryland in Baltimore and then earned a Licentiate in Sacred Theology at the Boston College School of Theology and Ministry while working as a deacon at the Massachusetts Institute of Technology. His first assignment as a priest will be at Holy Trinity Parish in Washington, D.C.
José A. “Pepe” Ruiz-Andujo, SJ, 32, is a native of Juarez, Mexico. He received a bachelor’s degree in philosophy from Saint Louis University and a Master of Divinity degree and master’s degree in theology with a focus on Ignatian spirituality from the Boston College School of Theology and Ministry. After ordination, he will serve as a campus minister at St. Louis University High School. James R. Shea, SJ, 42, was born and raised in Skokie, Illinois, a suburb of Chicago. He graduated with a bachelor’s degree in English and a master’s degree in philosophy from Loyola University Chicago. As a Jesuit, he was missioned to Cristo Rey Jesuit High School in Chicago, teaching English and helping with Kairos retreats. Martin O. Silva, SJ, 53, was born and raised in Manila, Philippines. He received an MBA from Pepperdine University in Malibu, California. Missioned to the Jesuit School of Theology of Santa Clara University in Berkeley, California, he earned a Master of Divinity degree while serving as a deacon at San Quentin State Prison. After ordination, he will serve at Blessed Sacrament Parish in Hollywood, California. Sean P. Toole, SJ, 33, is a native of Conshohocken, Pennsylvania. At Saint Louis University, he received a master’s degree in urban affairs in 2009. He spent the next three years at Cristo Rey Jesuit High School in Baltimore teaching U.S. government and working in campus ministry. After ordination, he will join the staff at St. Francis Xavier Church in Manhattan. Quang D. Tran, SJ, 30, was born and raised in New Orleans. At the Jesuit School of Theology of Santa Clara University in Berkeley, California, he earned a Master of Divinity degree and a Licentiate in Sacred Theology. He served as a deacon at Saint Mary’s College of California, preaching in English, Spanish and Vietnamese. He will next serve at St. Francis Xavier College Church in St. Louis. Ike M. Udoh, SJ, 34, was born in Walnut Creek, California, and then moved with his family to Benin City, Nigeria, when he was 2. He taught and worked in campus ministry at Jesuit High School in Sacramento, California, and taught theology and helped coach soccer for three years at Loyola High School of Los Angeles. Founded in 1540 by Saint Ignatius Loyola, the Society of Jesus (Jesuits) is the largest order of priests and brothers in the Roman Catholic Church. Jesuit priests and brothers are involved in educational, pastoral and spiritual ministries around the world, practicing a faith that promotes justice. In Canada and the United States, there are 30 Jesuit colleges and 80 pre-secondary and secondary schools with a shared goal of developing competent, compassionate and committed leaders in the service of the Church and society. Jesuits minister in parishes and at retreat houses and serve as chaplains at prisons, hospitals, nursing homes and in the military. In Canada and the U.S., the Jesuits are represented by the Jesuit Conference of Canada and the United States, headquartered in Washington, D.C. For more information on the Society of Jesus, visit http://www.jesuits.org.